Children may not be entitled to the same legal rights as an adult, but they are afforded basic legal rights. This means if they are harmed or wronged in any way, they can press charges against that individual and open a legal case against them, just as an adult could do. However, there are some very important differences when a child has been injured. You will need to speak to a Boca Raton personal injury attorney for complete information, but here are some things you should know before pursuing a personal injury case on behalf of your child. Anyone under the age of 18 who is not married or otherwise emancipated by order of the court is considered a child under Florida law. That means the child does not have full legal rights until he or she turns 18. This is also important for personal injury lawsuits because it means that a child cannot assert their legal rights, because they technically do not have any. As a parent or guardian, you may be able to assert a case on your child’s behalf. Generally, this type of case is seen in family law situations where the child may need representation in the division of a family. These individuals are usually called guardian ad litems to the child. When a child has a cause of action in a personal injury case, the statute of limitations often will not begin until he or she reaches the age of majority. For example, in a normal car accident case, an adult has four years after an accident to assert a claim for personal injuries. If a child was injured in a car accident when they are age ten, then the statute of limitations does not actually start until they are 18. This allows them time to assert a claim, but there can be downsides to asserting a claim this late as well. In particular, most of the evidence may have been destroyed, and witnesses’ memories may have long faded. Click here for more information about Florida car accidents. One of the major reasons that an individual files a personal injury claim is because their medical bills get out of control. 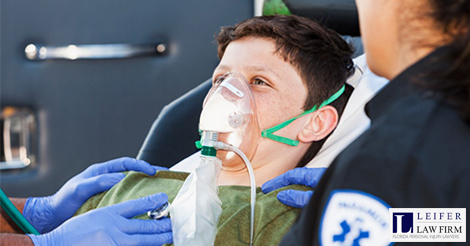 When a child is injured, his or her parents normally pay the medical bills associated with the injury. That means the child cannot claim this amount for damages because he or she did not pay for it. A situation involving these circumstances make it is difficult to get “reimbursement” as the child technically did not pay for the medical bills to begin with. Due to the fact that children do not have full rights under the law, the court may have to approve a settlement to be sure that the insurance company or other party is not taking advantage of them. Situations may arise where the court does not approve, but the parents do. These circumstances are rare. In addition, if the child is awarded any type of settlement, he or she may have to wait until they are 18 to actually receive any money. Read more about personal injury settlements for minors here. In some situations, it may make more sense to wait for the child to turn 18—such as when they are involved in a car accident at 16 or 17. In other situations, waiting may not be a real option. Your Boca Raton personal injury attorney can help you and your family decide what is best for your particular situation.